For convenient access to this article, you can get to it by visiting: SorryNoCalls.com. I know you've asked to setup a "quick call" to chat. Could be just an introductory "get to know you" call, or maybe we were recently introduced by a mutual connection. Or maybe you just want to "pick my brain". Or talk about your project/company/conference/. Sorry, but I don't take phone calls. I hate them. My aversion borders on the pathological. You will find this surprising and abnormal (because it is), but in a given year, I'll usually have < 15 non-personal phone calls. I often go weeks or months without a single call (joy! bliss!) When I do have them, I have to emotionally prepare myself. And, just so you know, I have a tough time with personal calls too, much to the disappointment of my parents. Hence, this article, which you can find at SorryNoCalls.com (domain setup to make it easy to reference. I might even print it on my business cards some day). 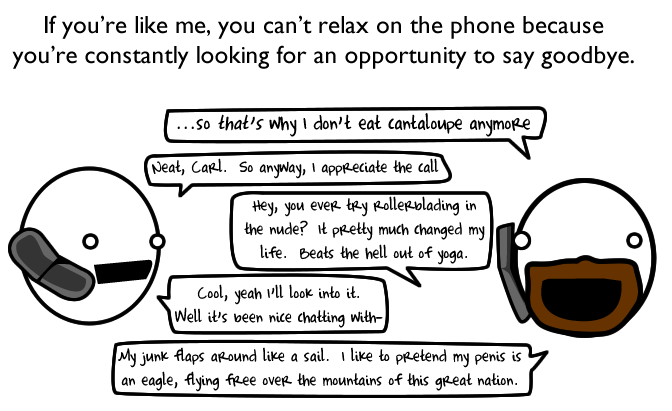 Here are the reasons why I hate phone calls so much. 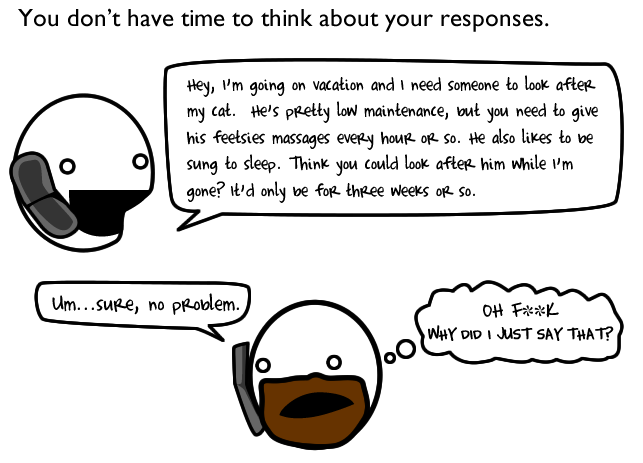 The images shown below are from an absolutely fantastic comic titled “10 Reasons To Avoid Talking On The Phone” by Matthew Inman of The Oatmeal. 1. 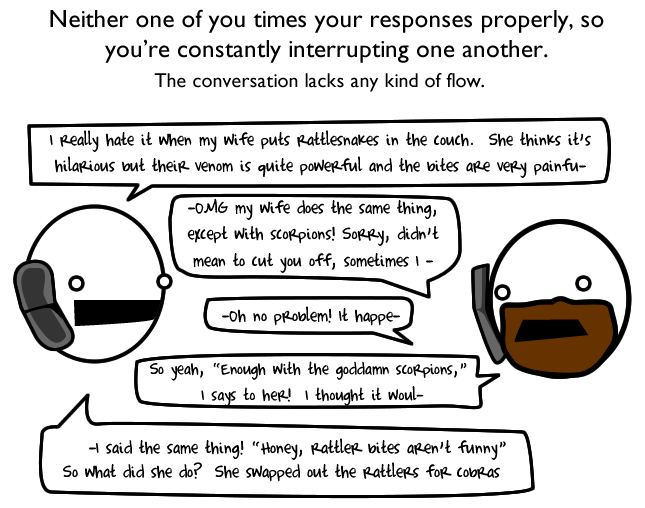 I don't like synchronous communications. A phone calls is a synchronous conversation. It breaks up my day and interrupts my flow. That's why I much prefer email, which I can “batch up” and do all at once, at my leisure and on my schedule. Handling things asynchronously also allows me to be more thoughtful about my response and match my degree of response to the importance of the situation. On a phone call, it seems rude to go into a long, detailed diatribe (even though the situation seemingly warrants it), because the other party doesn't have an easy way to “fast forward” (or skip). With email, I can write up my thoughts, get into detail if I want, with the knowledge that if the other person's not as interested as I thought, they can just move on. 2. I hate making small talk. Even when it's in person, small talk is difficult. On the phone, it's even harder. Now, some of you will argue: "It's OK -- you don't have to make small talk, most people are just fine if you jump right into it." Yes, it probably IS OK -- for you. But, I seem psychologically incapable of this level of emotional confidence. I'm an introvert. Not somewhat of an introvert. A complete introvert. And from what I've heard, it's not uncommon for introverts to not like small talk. I'm not sure exactly why that is for other introverts, but for me it's because it feels fake and I can't figure out what the right level of small talk is to be polite. I constantly feel awkward when I'm engaging in small talk, because I'm constantly trying to figure out in the back of my head, when it's OK to move into the “real” conversation. 3. I have a really hard time saying “no”. I have a serious problem. I'm pathologically non-confrontational. I have a really, really hard time pushing back and saying "no". And for reasons I don't fully understand, it's at its worst when I'm on the phone. Maybe it's because of the expectation of immediate answers and I have a deep fear of those awkward moments of silence on the phone. I don't know. Whatever it is, I know I have a problem. 4. I'm pathologically polite, and just can't get the timing right. When on a phone call, it feels like I'm always doing this delicate dance between trying to make sure there's not the dreaded period of silence that lasts too long — and the equally dreadful experience of inadvertently interrupting someone. I do this particular dance very poorly, know I do it poorly, and as such am self-conscious about it, and so end up doing it even more poorly. Vicious cycle. 5. I'm absolutely terrible at ending a call. So, to summarize my "sorry no calls". It's not you — it's me. I know you're probably not trying to sell me something. You're probably really good at having a normal phone conversation (like most people), so you think I'm exaggerating how I feel. Trust me, I'm not. Please accept my apologies for having this strange eccentricity. And, a word of thanks to my friends, family and colleagues. They've learned to accept this weakness of mine and don't take it to heart. I'm also thankful for the modest success I've had so far whereby I can design my life and circumstances around my pecularities. 1. I find it much less troublesome to schedule a call than just randomly answer the phone. 2. Setup a separate phone number (using something like Google Voice) which you only give out to folks you've scheduled a call with. You can program Google Voice to show the dialed number as caller ID (instead of the person calling). 3. To avoid the awkwardness around small-talk, try to outline what the topic of the conversation is going to be. 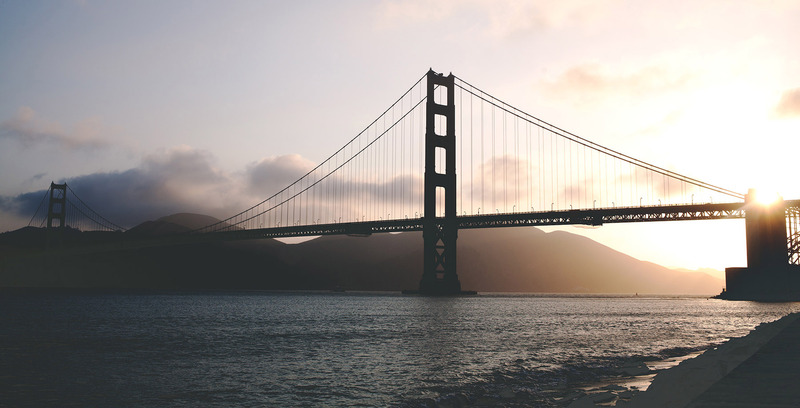 It makes you feel less guilty for transitioning into the purpose of the call. 4. Use email to get your high-level thoughts communicated first, and then use a phone call to add a personal touch or to have a higher bandwidth conversation. 5. Make it a firm policy to never say yes to something on the call. Always give yourself some time to think about it. I will often tell people that I never make an important decision on the phone -- and that they should follow-up and ask me over email. 6. Change the outgoing message on your voicemail letting people know that the preferred way to reach you is by email. Thankfully, this stops many telemarketers. 7. Remember that it's your life and you get to decide some things. If your work or personal life requires phone calls, that's cool. But, I think over 90% of the calls you'd normally take you are not obligated to take. We use the phone out of habit and because we think we have to. So, what about you? Do you share my aversion for phone calls? Or, are you a smilin' dialin' phone callin' machine? What's your take?